EVENT: ANDREW BUKENYA presents STRICTLY SOUL feat. Kate Munroe, Garry Tee & Phil Toke (Soul of Sydney) | SOUL OF SYDNEY FEEL-GOOD FUNK SOUL DISCO vibes & beyond. Big news in club land ! 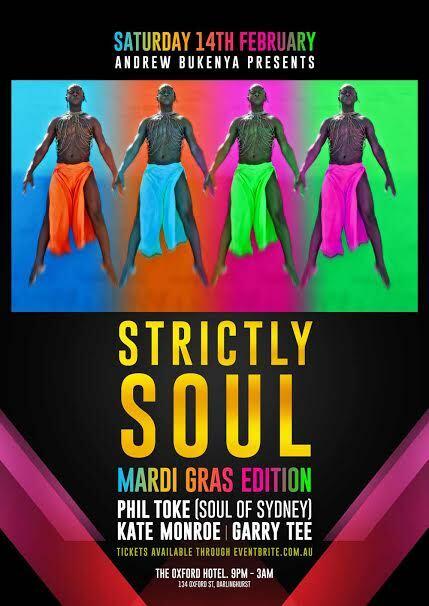 Soul of Sydney’s own Phil Toke will be warming things up at ANDREW BUKENYA’s infamous STRICTLY SOUL club night this month along side local legends DJ KATE MUNROE and GARRY TEE. A special night DANCE FLOOR HEAT we recommend for anybody looking to get down to serious quality black music. You can expect everything from Gospel House, New York Disco, Funk, Garage, 90’s House vibes, Afro-Latin Jams & and beyond. HalleLUJAH! Once again we open the church of SOULTASTIC bliss on Saturday FEB 14th. To kick off the holy season of Mardi Gras, for one fantastic VALENTINE’S night , the dancefloor of the UNDERGROUND BAR @the OXFORD HOTEL will be the sanctuary for all things FUNK n BEAUTIFUL, all soulheads great and small. 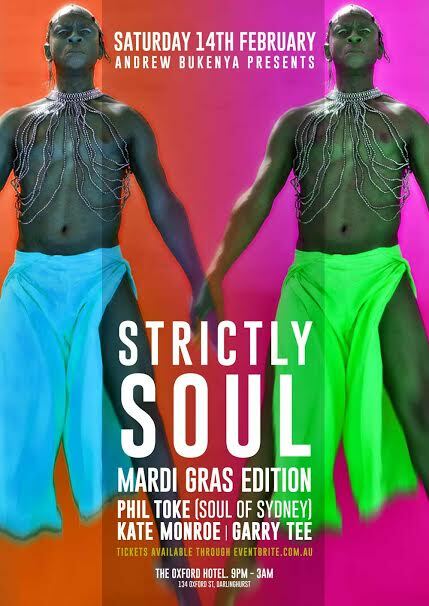 Spreading the incense from the holy turntables of fabulosity are Phil Toke from the Soul of Sydney order, sending out soul, rnb (new and ol’ skool), funk, hip hop, dancehall infused tunes n classic disco. Sydney’s high priestess of House Music, Ms Kate Monroe will be continuing the soul vibe with church inspired, gospel coloured,drumtastic deep house revelations. Rounding out the service is the one and only DJ Garry Tee bringing divine emotions to the heart, body and SOUL. If your soul has not been to church for a while…..
"let your BOOTY do the DUTY"